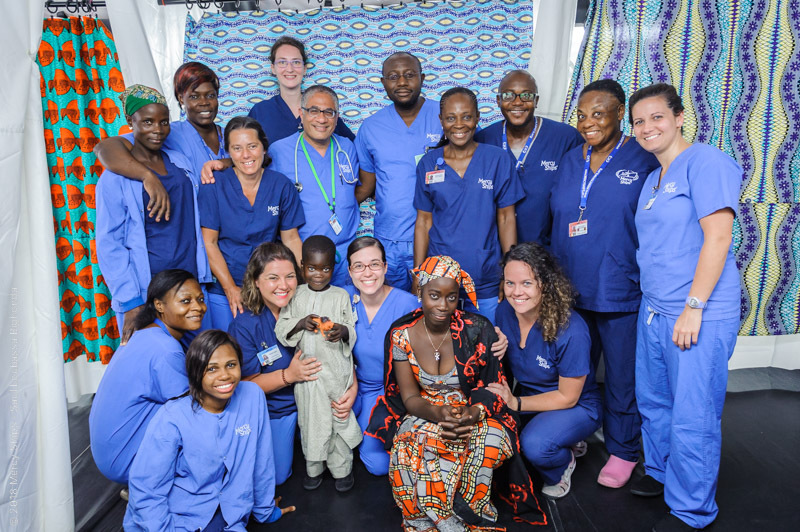 Photo caption: Dr. Sherif Emil, Dr. George Ngock (centre), and the screening team with a patient and his mother. Dispatch # 1: If you want to go far…. Boarding the Africa Mercy in Douala, Cameroon just before midnight on Sunday, March 11th, I find the Ship calm and quiet. Still, a logistics officer is waiting to get me settled with a warm “welcome back”. And I would hear that greeting over and over from one long-term crew member after another the next morning – a welcome back indeed. Following a weekly crew meeting and orientation, I join the nurses in the screening clinic. This will be my first chance to examine in person the patients the nurses have chosen for pediatric surgical procedures. Thirty six patients are scheduled. Rachel, a nurse from Northern Ireland, who has been on the Ship for several years, summarizes the history of each patient and the physical findings identified by the nurses. Brittany, an American, is the inpatient unit nurse coordinator. She attends every patient evaluation and carefully notes the post-operative plan. A Cameroonian interpreter helps us with patients who cannot speak French or English. This time, I am also accompanied by Dr. George Ngock, a Cameroonian pediatric surgeon, in whose training I participated a few years back. George gives me a unique perspective on several patients, and helps with some very difficult decisions. In five hours, all patients are seen and plans are made. An operating room schedule is created for the next three weeks, leaving gaps for additional patients who may present during my mission. It is a well-oiled machine, and a great reminder of the teamwork that allows Mercy Ships to be so effective and successful. As academic surgeons, we are driven by the desire to succeed – clinically and academically. Most of us are on a quest for significance – a legacy perhaps. Every time I have been on the Ship, I am reminded that true success can only be realized through common vision and common purpose. I have tried to remind myself and my colleagues of that. But I can’t say that I have been able to duplicate the spirit of the Africa Mercy in my own work environment. The crew and staff of Mercy Ships often recite an African proverb. “If you want to go fast, go alone. If you want to go far, go together.” In our Western societies, we are obsessed with going fast, with individual credit and accomplishment. But legacies are never created by going fast. They are only created by going far. The crew of the Africa Mercy has gone far – very far – because they have always gone together. Dr. Sherif Emil is a pediatric surgeon and Director of the Division of Pediatric General and Thoracic Surgery at the Montreal Children's Hospital. Over 3 weeks, he will be part of the volunteer crew of the Africa Mercy, currently docked in Douala, Cameroon. The Africa Mercy is the world's largest civilian hospital ship dedicated to bringing hope and healing to tens of thousands of the world's impoverished populations.